I have been to Bangkok many times but surprisingly, I have never heard of the Erawan Museum until my last visit in January this year. When my friend and I got out of the taxi, we were certainly not prepared to see a huge, gigantic three-headed elephant in front of us! The spot where we alighted from the taxi was however not the entrance into the museum. It was a shrine for people to pray in front of the Elephant without entering the museum. We had to walk a little bit further round the corner to reach the front gate. 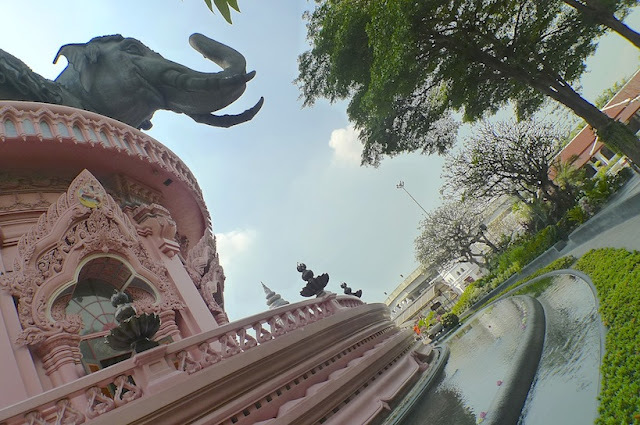 The Erawan Museum, located in the Samut Prakan district, does not seem to be in the mainstream list of tourist attractions in Bangkok. 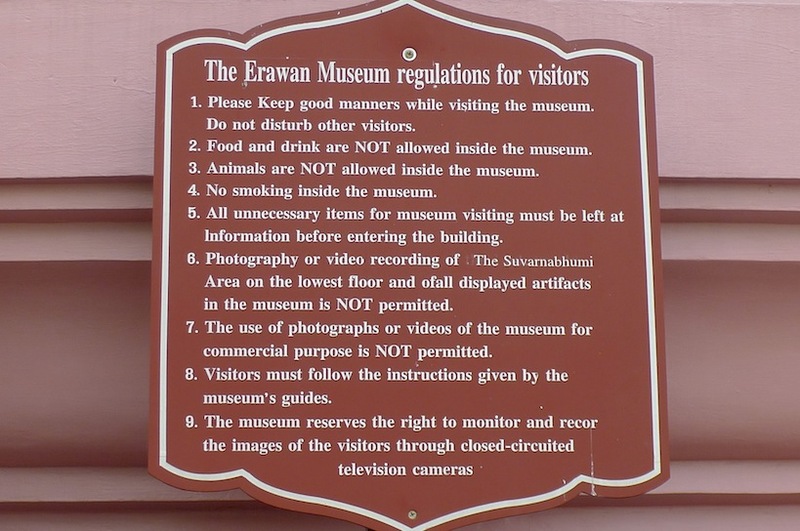 I wonder why, as it was to me, one of the most fascinating museums I have ever visited! 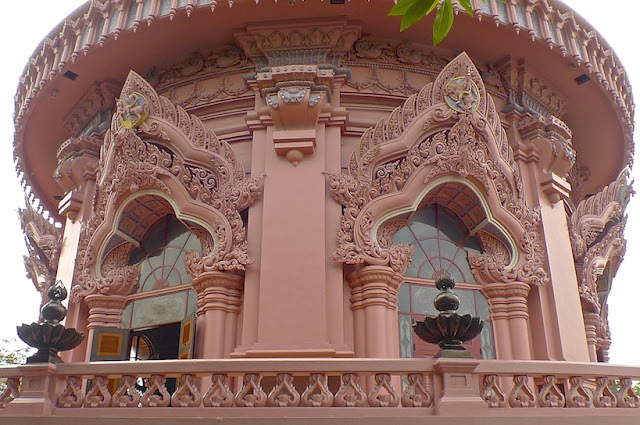 I said fascinating because this is not just any normal museum, but rather a combination of an elaborately created museum and temple. 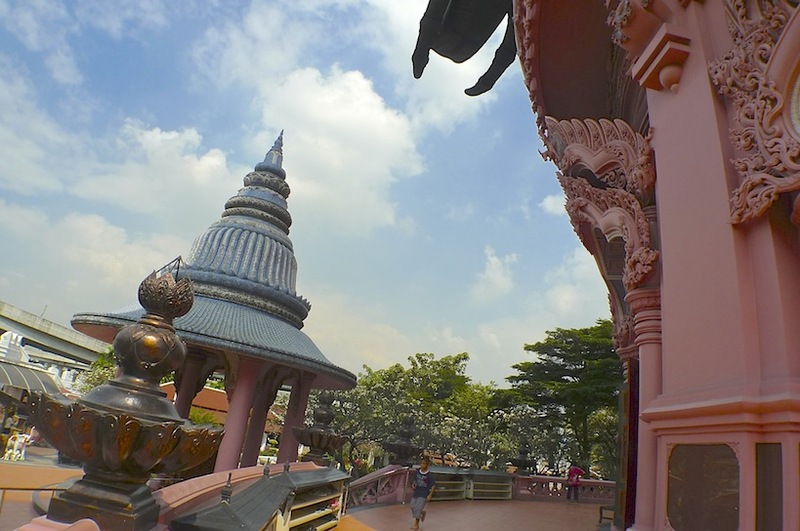 After exploring the whole place, I realized the museum is an all-in-one showcase of history, culture, religion, spirituality, architecture and art! 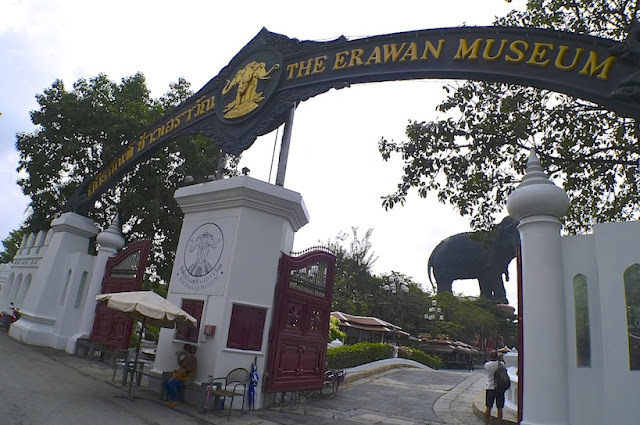 The word Erawan is a Thai name for the three-headed elephant, which is actually a depiction of Airavata, the white elephant that carries the Hindu God Indra according to Indian mythology. 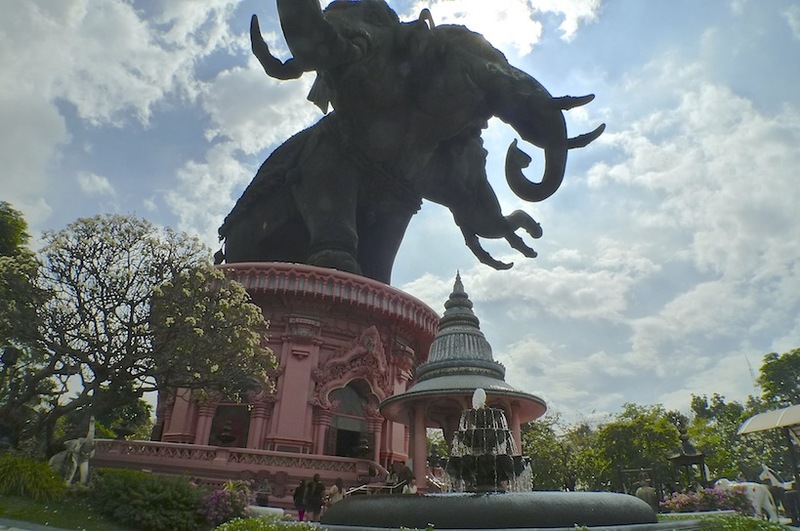 The museum was the brainchild of the late, eccentric Thai business tycoon Lek Viriyabhun, who originally built it to show his vast collection of Asian antiquities, but soon ended up as something much bigger. 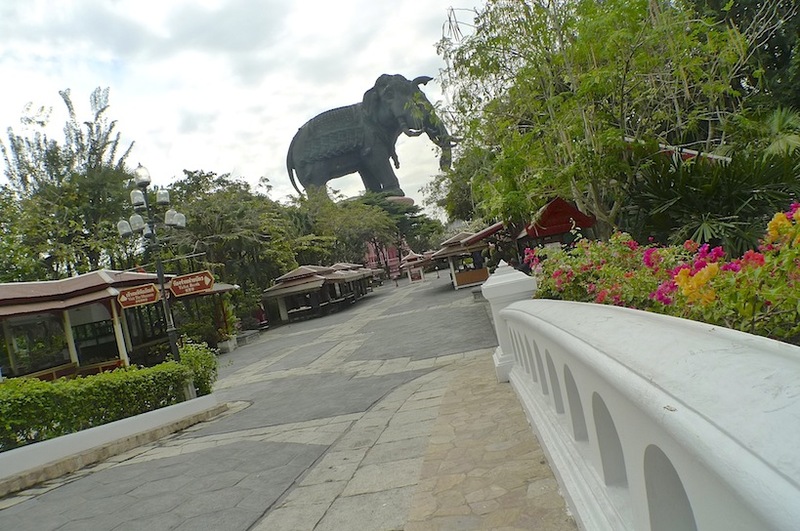 As we walked along the pathway from the front gate, I could not take my eyes off the giant elephant statue. I could not wait to see it up close! We first proceeded to the ticket booth. 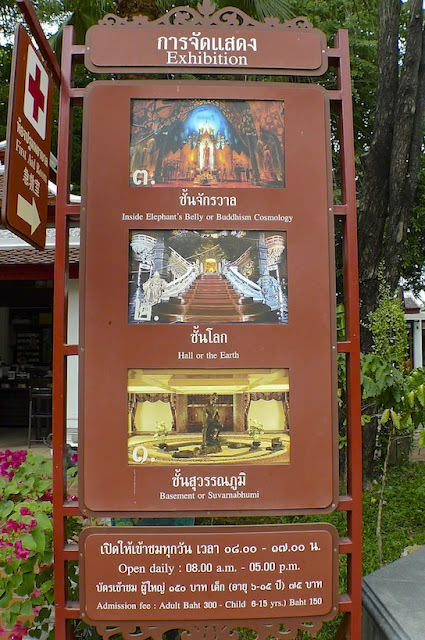 The entrance ticket costs 300 baht (USD9.90 / RM30.60) per adult. A little pricey perhaps, but I think it's still worth it. The museum building was divided into 3 levels - the Basement or Suvarnabhumi (which represents the Underworld), the Hall (which represents Earth or the human realm) and inside the Elephant's belly (which represents Heaven). Yes, you read that right. 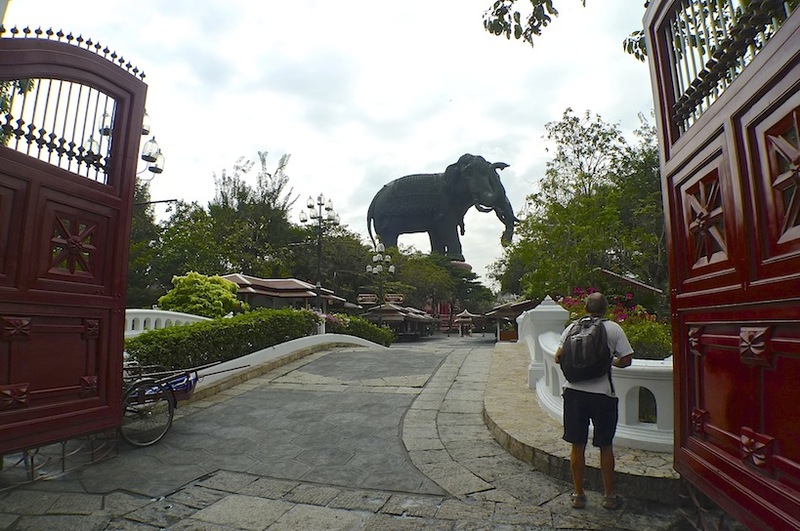 You can enter the Elephant's belly! 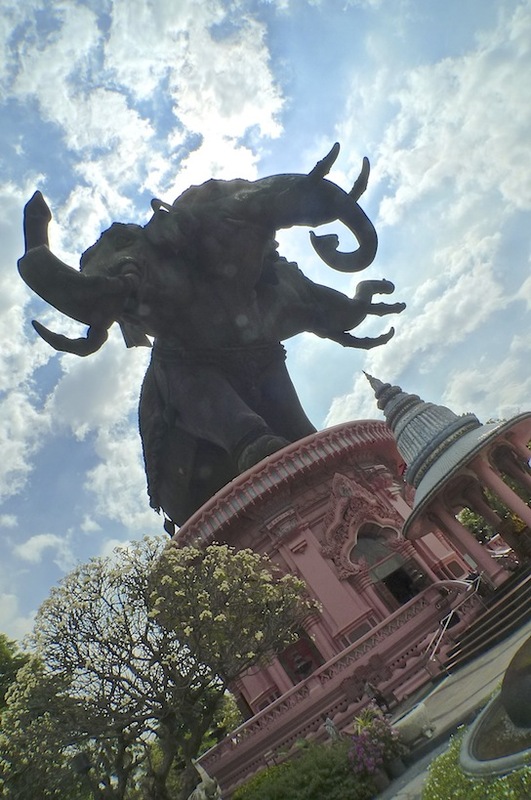 And I thought it was just a giant statue on top of the museum! Surrounding the museum is a beautiful tropical flower garden complete with mythical Thai sculptures and running water. More about this garden later. 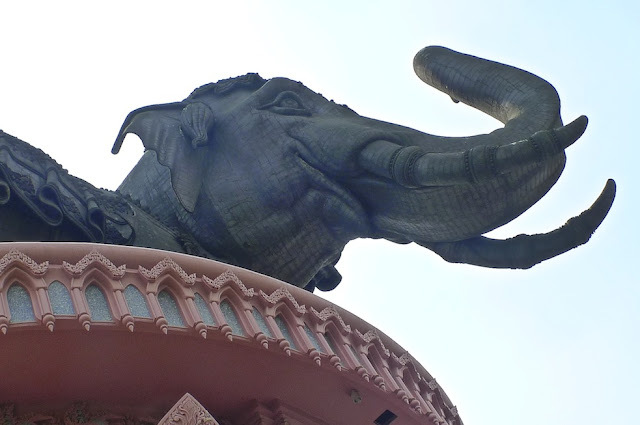 This is how the colossal three-headed copper elephant looks like against the cloudy blue sky. It was such an incredible sight I do not think my poor quality photo can do it justice. You just need to be there to see it for yourself! 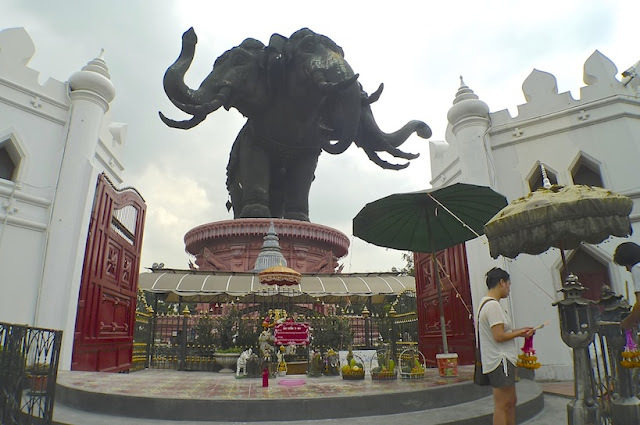 Weighing about 250 tons, this gigantic elephant took almost 10 years to construct! There's a stream surrounding the circumference of the base of the museum. I was immediately distracted by a couple kneeling at one end of the stream. What were the couple doing? 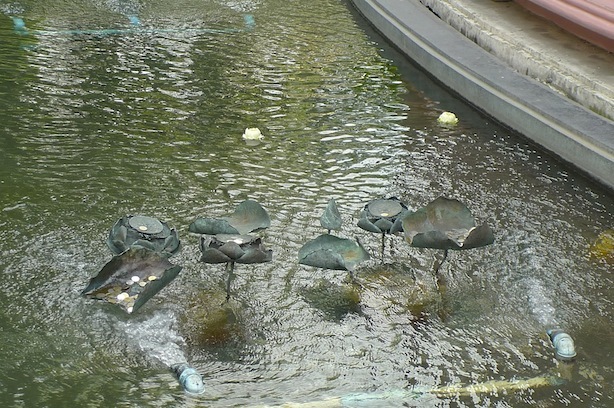 I soon learnt that they were floating lotus flowers on the stream. There were in fact, many lotus flowers traveling on the stream. Can you see them? Now here's something interesting. The price of admission actually gets you a lotus bud, which you can then send it floating into the stream after you have made a wish. 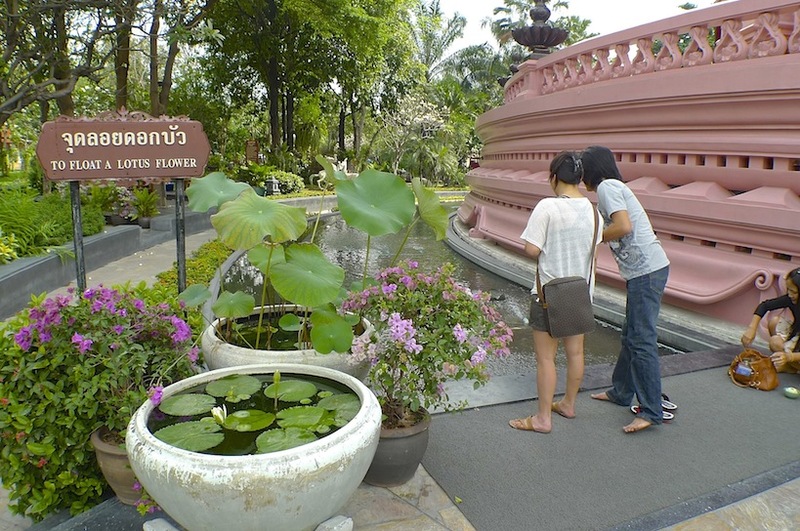 According to the locals, if the lotus flower floats all the way to the end of the stream surrounding the museum, your wish will come true! 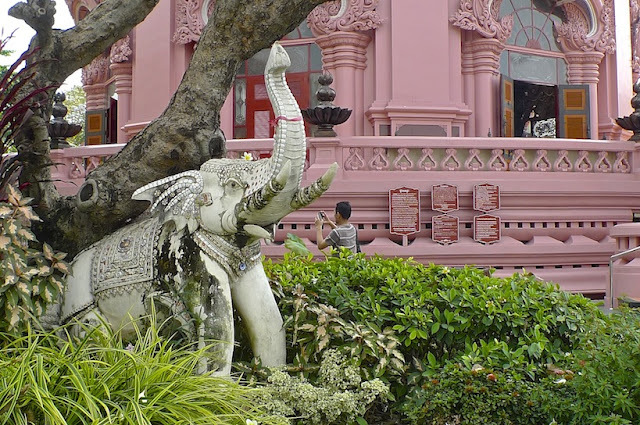 But if your lotus flower gets snagged and stops before making it around the museum, then your wish will not materialize. 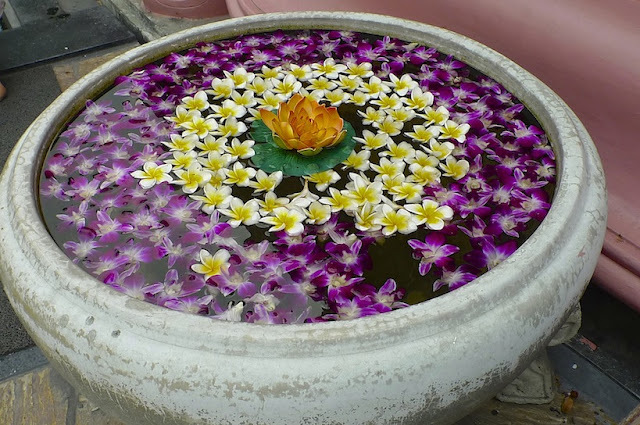 Perhaps you will need to buy more lotus flowers and try to make a more realistic wish! LOL! 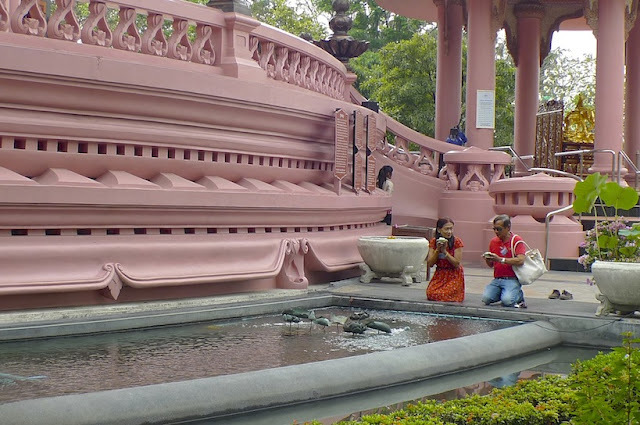 Besides floating lotus flowers, you can also throw coins like what these two ladies were doing. Can you see where all those coins landed? They should not land inside the water or your wish will not be granted, or so it seems. Another lady seen here releasing her lotus bud on the water. 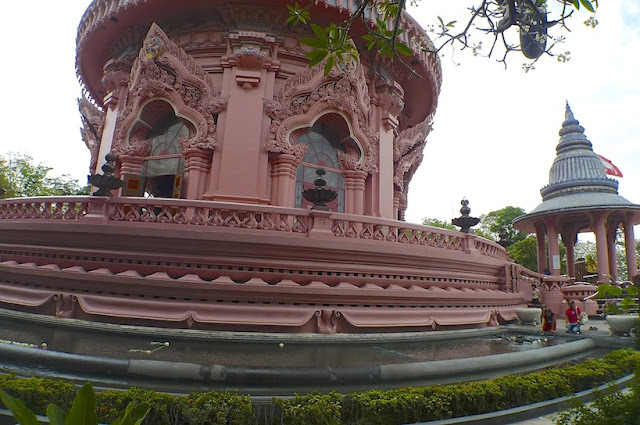 I did not really believe in the wish-granting lotus flower theory but that did not stop me and my friend from trying it out! LOL! 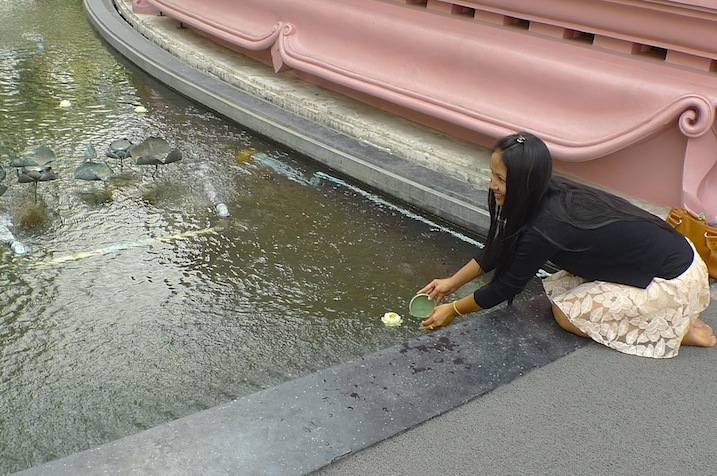 After making our wishes, both my friend and I released the lotus flowers into the stream. We followed the flowers as they moved along the stream, hoping they would not stop halfway. Midway, I was distracted by one of the elephant's head and tusks hovering above us. It sure looked incredible from here! We reached the end of the stream, but where were our lotus flowers? No where to be seen. Our wishes had just gone down the drain! Oh well, at least it was fun. LOL! It was time to enter the museum proper. But first let's take a look at the rules and regulations. We entered the Basement first. 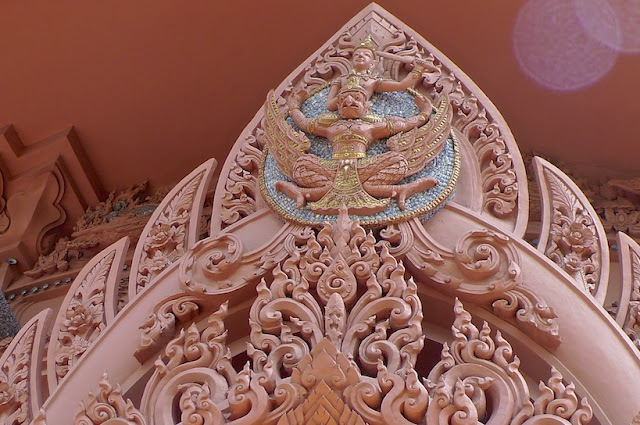 It represents the Underworld, according to the Buddhist conception of the Universe. Photography was not allowed here so sorry, no photos. It mainly houses a collection of antique ceramics and art, probably most of them belonging to the founder Lek Viriyabhun. The Basement felt like a real museum to me. After that, we moved on to the Hall or the large central area above the Basement. The intricate design on the exterior part of the building was interesting. A close-up shot of the carvings. 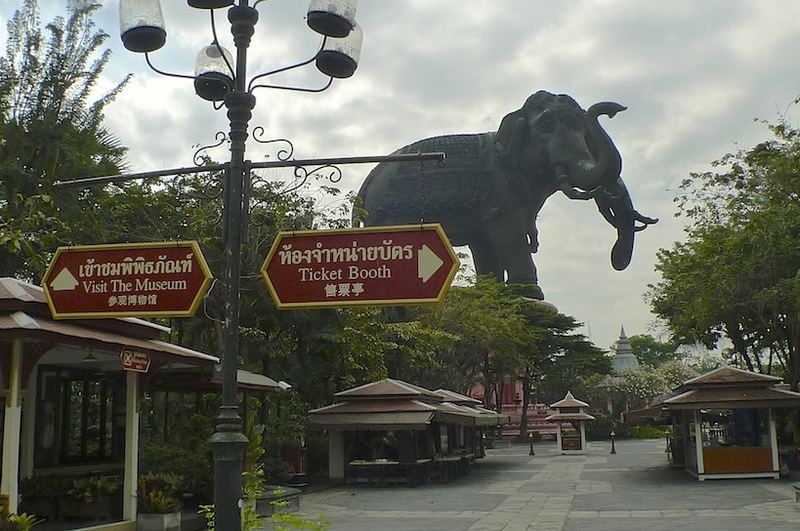 The view from outside the Hall with part of the Elephant's tusks in the photo. 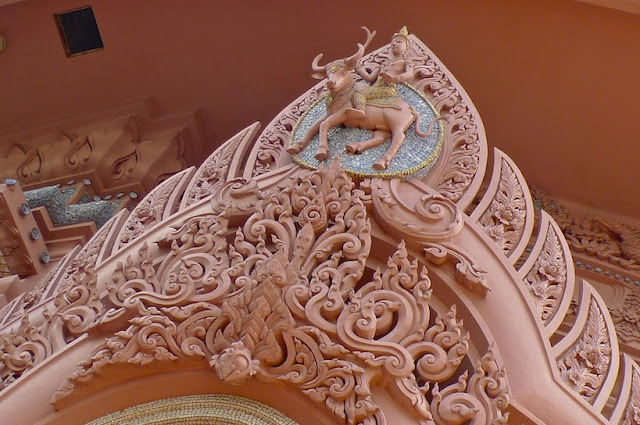 As I entered the Hall which was said to represent both the human realm of the Buddhist universe and Mount Meru, the centre of the Hindu universe, I was stunned by what I saw. What? 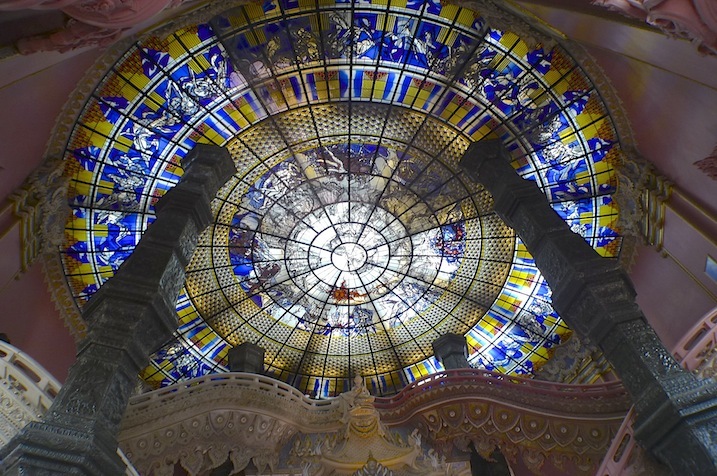 Stained glass windows? Christianity? !